George Alexander Aberle, known as eden ahbez  (April 15, 1908 – March 4, 1995), was an American songwriter and recording artist of the 1940s to 1960s, whose lifestyle in California was influential in the hippie movement. He was known to friends simply as ahbe. The Hollywood Sign is an American landmark and cultural icon overlooking Hollywood, Los Angeles, California. 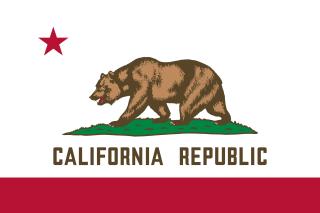 It is situated on Mount Lee, in the Hollywood Hills area of the Santa Monica Mountains. The Orient is a historical term for the East, traditionally comprising anything that belongs to the Eastern world, in relation to Europe. In English, it is largely a metonym for, and coterminous with, the continent of Asia, loosely classified into the Near East, Middle East and Far East: the directional regions now known today as western Asia, southern Asia, eastern Asia, and southeast Asia. Originally, the term Orient was used to designate the Near East, and later its meaning evolved and expanded, designating also the Middle East or the Far East. The Brooklyn Hebrew Orphan Asylum was an orphanage constructed in Brooklyn, New York. The Brooklyn Hebrew Orphan Asylum branched off from the Hebrew Orphan Asylum of New York when that organization narrowed its support to children in Manhattan. The Brooklyn organization was created by philanthropic members of Temple Israel and K.K. Beth Elohim. Among those who spent part of their childhood there are Hannah Tompkins and eden ahbez. The Hebrew Orphan Asylum of New York (HOA) was a Jewish orphanage in New York City. It was founded in 1860 by the Hebrew Benevolent Society. It closed in 1941, after pedagogical research concluded that children thrive better in foster care or small group homes, rather than in large institutions. The successor organization is the Jewish Child Care Association. Gypsy Boots, born Robert Bootzin, was an American fitness pioneer, actor and writer. He is credited with laying the foundation for the acceptance by mainstream America of "alternative" lifestyles such as yoga and health food. His books Barefeet and Good Things to Eat and the memoir, The Gypsy in Me, gained him a cult following. In monotheistic thought, God is conceived of as the supreme being, creator deity, and principal object of faith. The conceptions of God, as described by theologians, commonly include the attributes of omniscience (all-knowing), omnipotence (all-powerful), omnipresence (all-present), and as having an eternal and necessary existence. Depending on one's kind of theism, these attributes are used either in way of analogy, or in a literal sense as distinct properties. God is most often held to be incorporeal (immaterial). Incorporeality and corporeality of God are related to conceptions of transcendence and immanence of God, with positions of synthesis such as the "immanent transcendence". Psychoanalyst Carl Jung equated religious ideas of God with transcendental aspects of consciousness in his interpretation. Infinity is a concept describing something without any bound, or something larger than any natural number. Philosophers have speculated about the nature of the infinite, for example Zeno of Elea, who proposed many paradoxes involving infinity, and Eudoxus of Cnidus, who used the idea of infinitely small quantities in his method of exhaustion. This idea is also at the basis of infinitesimal calculus. Ahbez continued to supply Cole with songs, including "Land of Love (Come My Love and Live with Me)", which was also covered by Doris Day and The Ink Spots. In 1949, he gave Burl Ives the idea to cover Stan Jones' "Ghost Riders In The Sky" after overhearing Jones recording his own version of the song. He worked closely with jazz musician Herb Jeffries, and, in 1954, the pair collaborated on an album, The Singing Prophet, which included the only recording of ahbez's four-part "Nature Boy Suite". The album was later reissued as Echoes of Eternity on Jeffries' United National label. In the mid 1950s, he wrote songs for Eartha Kitt, Frankie Laine, and others, as well as writing some rock-and-roll novelty songs. In 1957, his song "Lonely Island" was recorded by Sam Cooke, becoming the second and final ahbez composition to hit the Top 40. During the 1960s, ahbez released five singles. Grace Slick's band, the Great Society, recorded a version of "Nature Boy" in 1966 and ahbez was photographed in the studio with Brian Wilson during a session for the Smile album in early 1967. Later that year, British singer Donovan sought out ahbez in Palm Springs, and the two wanderers shared a reportedly "near-telepathic" conversation. In the 1970s, Big Star's Alex Chilton recorded a version of "Nature Boy" with the photographer William Eggleston on piano. The song was finally released as a bonus track on the 1992 Rykodisc re-release of the album Third/Sister Lovers . He died on March 4, 1995, of injuries sustained in a car accident, at the age of 86. Another album, Echoes from Nature Boy, was released posthumously. Nathaniel Adams Coles, known professionally as Nat King Cole, was an American jazz pianist and vocalist. He recorded over one hundred songs that became hits on the pop charts. His trio was the model for small jazz ensembles that followed. Cole also acted in films and on television and performed on Broadway. He was the first African American man to host an American television series. 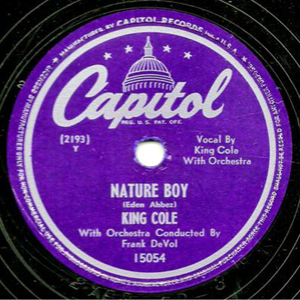 "Nature Boy" is a song written by Eden Ahbez and later popularised by Nat King Cole, in 1948. Fitzgerald and Pass...Again is a 1976 studio album by Ella Fitzgerald, accompanied by jazz guitarist Joe Pass, the second of four duet albums they recorded together after Take Love Easy (1973). Kyle Vincent is an American singer/songwriter/multi-instrumentalist, and entertainer, labeled as the "crown prince of soft pop," by Goldmine. His debut single, "Wake Me Up " peaked at #1 on the Billboard Bubbling Under Hot 100 Singles chart. Stephen John Kalinich is an American poet mostly known for his songwriting collaborations with Brian and Dennis Wilson of the Beach Boys. In 1969, he recorded his only album, A World of Peace Must Come, with production by Brian Wilson. It was unreleased until 2008. The Boy with Green Hair is a 1948 American fantasy-drama film in Technicolor directed by Joseph Losey. 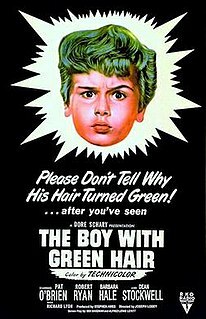 It stars Dean Stockwell as Peter, a young war orphan who is subject to ridicule after he awakens one morning to find his hair mysteriously turned green. Co-stars include Pat O'Brien, Robert Ryan, and Barbara Hale. Joe Romersa is an American musician, composer, voice actor, and music producer. The Nat King Cole Songbook is a 1965 studio album by Sammy Davis, Jr., recorded in tribute to singer and pianist Nat King Cole, who had recently died. Dear Mr. Cole is a Nat King Cole tribute album by jazz guitarist John Pizzarelli. Pizzarelli is accompanied by pianist Benny Green, and bassist Christian McBride on all but one song. Straight Life is a 1979 jazz album by saxophonist Art Pepper playing with Tommy Flanagan, Red Mitchell, Billy Higgins and Kenneth Nash. War Crime Blues is the eleventh album by singer-songwriter and guitarist, Chris Whitley. It is his ninth studio album. Dawganova is a 1995 all-instrumental album by American musician David Grisman, recorded with his group The David Grisman Quintet. It's a unique collection of Latin rhythms and melodies inspired by the group's newest member, Argentine guitar virtuoso, Enrique Coria. Five Grisman originals are accompanied by classical Latin standards: "El Cumbanchero", "Tico Tico", "Manha de Carnaval" and the Nat "King" Cole classic "Nature Boy". Night Lights is an album by saxophonist Gene Ammons recorded in 1970 and released on the Prestige label. 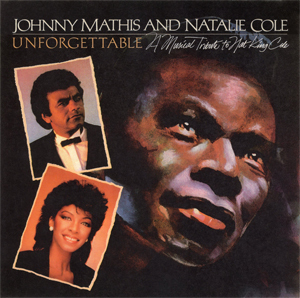 Unforgettable – A Musical Tribute to Nat King Cole is a soundtrack album released in the UK in 1983 by the CBS Records division of Columbia in conjunction with the broadcast of American pop singer Johnny Mathis's BBC television concert special of the same name that featured Cole's daughter Natalie. The front of the original album jacket credits the concert performers as "Johnny Mathis and Natalie Cole", whereas the CD booklet reads, "Johnny Mathis with special guest Natalie Cole". Herman Yablokoff, sometimes written Herman Yablokov, Herman Yablokow, etc., was a Belarusian-born Jewish American actor, singer, composer, poet, playwright, director and producer who became one of the biggest stars in Yiddish theatre. William Frederick "Bill" Pester was a German-born American pioneer of hippie lifestyles in California in the first half of the twentieth century, known as "the Hermit of Palm Springs". He was described as epitomizing "the strong link between the 19th century German reformers and the flower children of the 1960s", and inspired the eden ahbez song "Nature Boy", recorded by Nat King Cole and others. John Theophilus Richter and Vera M. Richter were an American married couple who ran an early raw food restaurant in Los Angeles, the Eutropheon, which became a meeting place for influential figures in the development of alternative lifestyles in California between 1917 and the late 1940s. ↑ "Eden Ahbez - United States Social Security Death Index". FamilySearch. Retrieved May 11, 2013. ↑ "Little Known Brooklyn Residents: eden ahbez". Brooklyn Public Library. Archived from the original on September 9, 2012. Retrieved October 7, 2012. 1 2 "Letter to the Editor: Nature Boy". Life. June 22, 1948. pp. 9–10. ↑ "A Strange, Enchanted Boy". BBC Radio 4 . Retrieved June 29, 2010. 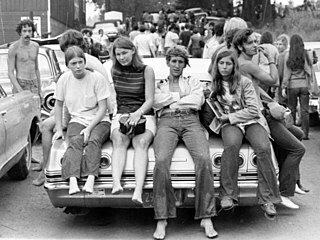 ↑ "Hippie Roots & The Perennial Subculture". Hippy.com. Archived from the original on August 30, 2007. Retrieved June 29, 2010. ↑ Iacobbo, Karen; Iacobbo, Michael (2004). Vegetarian America: A History. p. 171. ↑ Shurtleff, William; Aoyagi, Akiko (2009). History of Soybeans and Soyfoods in Africa (1857-2009). p. 306. ISBN 978-1928914-25-9. ↑ "Nature Boy". JazzStandards.com. 1948. Retrieved February 8, 2013. ↑ "Little Known Brooklyn Residents: eden ahbez". Brooklyn Public Library. July 22, 2010. Archived from the original on March 10, 2013. Retrieved February 7, 2013. ↑ "Nature Boy". LIFE. May 10, 1948. pp. 131–35. ↑ Prady, Norman (March 24, 2006). "Our very brief brush with fame". The Christian Science Monitor . ↑ "Speaking of Pictures...These Babies Were Born to Famous People in 1948". LIFE. January 3, 1949. pp. 5–7. ↑ "First on Capitol Records: Nature Boy". The Cash Box. June 5, 1948. p. 14. ↑ "Jack Patton". Cash Box. September 11, 1993. p. 21. ↑ "Green Hair Trouble". Life. December 6, 1948. p. 83. ↑ "Herman Yablokoff". The Milken Archive of American Jewish Music. Retrieved March 21, 2011. ↑ Gottlieb, Jack (2004-07-09). Funny, it doesn't sound Jewish: how Yiddish songs and synagogue melodies influenced Tin Pan Alley, Broadway, and Hollywood. 1. SUNY Press. p. 78. ISBN 978-0-8444-1130-9. ↑ "Ain't 'Nature Boy' Grand; Eden Spurs 'Riders In The Sky'", Billboard, March 5, 1949, p. 18. ↑ Chidester, Brian. 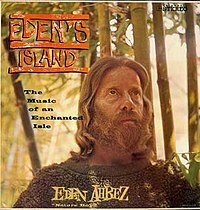 "Eden's Island: A blog about eden ahbez, the composer of "Nature Boy"" . Retrieved April 16, 2013. ↑ "Grace Slick and the Great Society - Nature Boy - YouTube". RoachForge. Retrieved April 16, 2013. ↑ Chidester, Brian (March 4, 2015). "Finding Nature Girl" . Retrieved June 29, 2015. ↑ Chidester, Brian (February 18, 2014). "Eden Ahbez: The Hippie Forefather's Final Statement to the World". Los Angeles Times. Retrieved February 18, 2014. ↑ "Fuller Up Dead Musician Directory" . Retrieved June 29, 2010.